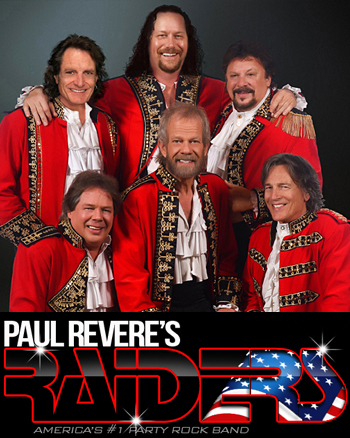 Paul Revere’s Raiders | Concerts At Sea 50s & 60s Themed Oldies Cruise - Where The Action Is! It took PAUL REVERE years to perfect the slick, fast-paced, dynamo of a show that has entertained audiences all over the world, an act that features his hand-picked band of the best showmen in the business. After decades of performing this well-oiled machine Paul had decided to get off the road and hand over his legendary three-cornered hat to THE RAIDERS. Sadly, he passed away just a year later. Continuing the PAUL REVERE AND THE RAIDERS tradition is the extremely talented foundation of the show, long-time members (over 40 years each), DOUG HEATH, RON FOOS & DANNY KRAUSE. RESERVATION, when guitarist Doug Heath joined the band. Along with Paul Revere, Mark Lindsay and Freddy Weller Doug played on the Columbia Records release, THE LEGEND OF PAUL REVERE and he’s been a Raider ever since. Other than Paul Revere himself, Doug Heath is the longest reigning Raider in the history of the band – nearly 50 years! Rounding out the lineup is Paul Revere’s talented son on guitar, JAMIE REVERE, frontman DAVID HUIZENGA, with his unique style and incredible energy and powerhouse drummer & showman TOMMY SCHECKEL, who was a member of The BUCKINGHAMS for 27 years. Together, THE RAIDERS continue to bring you the great PAUL REVERE & THE RAIDERS hits that you’ve come to enjoy over the years, along with the showmanship that has set them apart from most other bands performing today. The music and laughs continue, and the tradition lives on!